Arrowheads are easy to grow as aquarium or bog plants. The principal species and variants in aquarium use have been with the hobby for about as long as we've had aquariums. Indeed, Sagittaria tubers have been a human staple in North America and Asia before recorded history. And what a group it is, the genus Sagittaria was at one time considered to contain over sixty species and varieties; big, small, some with very different submerged and emergent growth, differing markedly still under varying lighting and other growing conditions. Recent schema for classifying the arrowheads divide them into some 17 species, 13 subspecies and varieties. Definitive characteristics of use to hobbyists are geographic origin, leaf venation, shape and size, and flower characteristics. Still, whatever types you utilize, these are great plants, hardy and useful in all types of freshwater systems. Sagittariaare part of the Alistamaceae, the water-plantain family that includes another important aquarium plant group, the Swordplants of the genus Echinodorus. In the wild, most of these are amphibious marsh plants, of long stemmed aerial leaves, oval to sagittate ("arrow-shaped") in outline. The smaller submerged types bear more linear leaves and reproduce quickly by runners and the occasional small floating flower. In aquarium use, hobbyists are generally more interested in juvenile, submerged forms; keeping the plant body underwater by either selecting smaller species, containing them in suitable sized systems, or manipulating them through light or trimming procedures. A note regarding the terminology of "variants" or "varieties", notated as "var.". This sub-specific (lower than a species) ranking designates that these organisms are appreciably different, yet not independent enough to be considered as separate species. In practical terms this means that the variants within a species are potentially capable of crossing. If your interests include propagating these "varieties" sexually, prudence in keeping them apart or artificially pollinating them must be exercised. Sagittaria gramineawe'll use as our introductory species to give you a feeling for the overall state of arrowhead classification and use. This species is currently divided into some seven variants (cristata, chapmanii, macrocarpa, teres, graminea, platyphylla, weatherbiana). We will concern ourselves with only the last three as these forms are of most common use and availability to aquarists. Synonyms:S. eatonii, S. acutifolia, S. simplex, S. purshii. Natural Distribution & Ecology: Eastern U.S. to Texas. Physical Description:Variable spear-shaped underwater leaves 6-10 inches long, 1/2" wide, with five longitudinal veins at the base ending with three at tip. Natural Distribution & Ecology: Southern U.S.; introduced into Java, Indonesia, Mexico and other places in Central America. Physical Description:Aerial leaves of arrowhead lanceolate shape; submerged forms with leaves of 8-12 inches length and up to 1" width narrowing to three quarters at their base. Leaves with seven to nine longitudinal veins, terminating in one central rib at their pointed or rounded tips. Natural Distribution & Ecology: U.S. & Australia (introduced). Physical Description:Very like S. g. platyphylla. Submerged leaves to 8 inches in length, one inch wide narrowing at their base. Leaves with five to seven longitudinal veins, interior ones coalescing with the central rib, ending at the leafs pointed tip. More pronounced cross venation. Synonyms:S. lorata, S. natans, Alisma subulatum. Natural Distribution & Ecology: U.S. east coast. Physical Description:Leaves from 8-12 inches in length and 1/4" wide; with three longitudinal veins, the outer two ending at their blunt end. 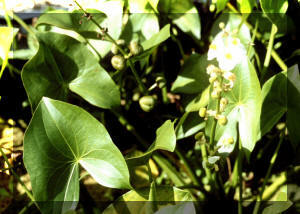 Named floating arrowhead for its proclivity to produce whorls of white flowers on floating stems. Natural Distribution & Ecology: Eastern North America. Physical Description:Upright, linear leaves of 2-6 inch length and 1/4" width. Leaves with three longitudinal veins with central one ending at blunt tip. Natural Distribution & Ecology: North America & New Guinea. Synonyms:S. kurziana, S subulata var. natans. Natural Distribution & Ecology: North America. Physical Description:Leaves 12-20 long, to 2/3" wide, with three longitudinal veins; the central one alone ending at the tip, laterals terminating along the leaf margin. Sagittaria latifolia WILLDENOW Broadleaf sag. or arrowhead, giant aquarium sagittaria, wapato, duck potato (for its edible tuber). Synonyms:S. sagittifolia var. sinensis, S. sinensis, S. macrophylla. Natural Distribution & Ecology: Much of North America to upper South America. Introduced into France and Bulgaria. A plant more suitable for pond than aquarium use. Physical Description:Broad lineal leaves up to 18 inches long, one inch wide. SynonymsA newer (1975) plant to the trade; often erroneously offered as S. platyphylla. Natural Distribution & Ecology: Central America & northern South America. Physical Description:Leaves more ribbon-like, with gradually narrowing, pointed tips. Leaves to 8 inches in length, 2/3" wide, with five to seven longitudinal veins, the center one thickest. A beautiful amphibious plant that does well also in aquariums. The common, bog, or pond arrowhead. Natural Distribution & Ecology: Europe & Asia. Physical Description: Most often shown as a bog plant and better suited for outdoor use. Listed here to call note as such; temperatures UP TO the low seventies. Several cultivars with gorgeous flowers and foliage for ponds. Aerial leaves to six feet. For cool/cold water aquariums, S. sagittifolia can be made to stay underwater by housing in water of two or more foot depth and trimming. Particularly useful as foreground and background plants; hardy and emerald green with or without CO2. Substrate/Soil:Sag.s ("Sadges") prefer nutrient rich soil. Regular loam replacement and water augmentation shows in much more luxuriant growth. Light/Lighting (intensity, spectrum, duration): Intense 15-25k lumens for half day dark/light cycle. Temperature Range:Most species kept for aquariums are tropical; some cool water bog forms. Species Kept With:Most everything that won't overshadow them. Sag.s appreciate strong direct lighting. Trimming:Removal of adult and adventitious root-plantlets to prevent overcrowding. Folks with shallow tanks, tall species, lack of desire for aerial growth may cut emergent growth with clippers, promoting/sustaining greater aquatic leaf production. Mainly asexually through plantlets forming via their numerous lateral runners. Sagittaria can of course be grown from seed or corm tubers. The world of arrowheads is a dizzying mess in terms of easy identification of actually species and varieties; but a real dream in the way of hardy, adaptable plants for cool and tropical aquariums, greenhouses and outdoor ponds. 1) Sagittaria subulata var. pusilla, the most common dwarf sag. in the west; a great foreground plant. Here shown with a demanding red rainbowfish, Glossolepis incisus, spawning mop and gorgeous Riccia fluitans floating at the surface. 2) S. subulata var. gracillima. My, what a difference a sub-specific standing can make! Same species as above, different variant. Note the occasional small white flowers. Also, check out the robust white roots of this sag. compared with Vallisnerias which are much more delicate and less white... also Val.s longitudinal leaf veins all end at their tips unlike sag..